Several weeks ago I entered a giveaway at Karen B's blog, Todolwyn. The prize was yummy, but to be honest, I didn't expect to win, because... well, I rarely win anything! But I got a wonderful surprise a week or so ago when she announced that I was indeed the winner! Yea me!!!! 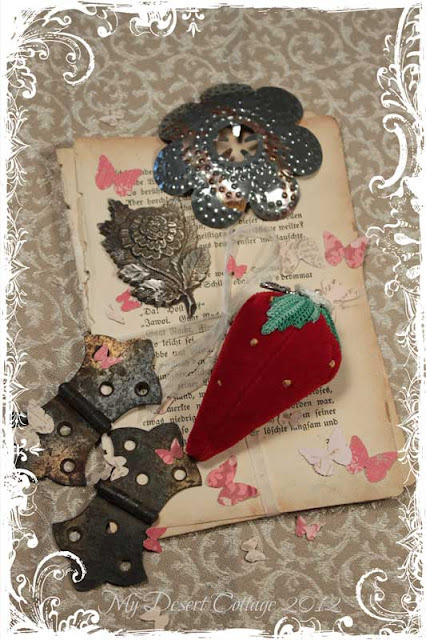 I love what she gave away because it was sweet supplies that I can use to create fun projects. I love already inked tags because I can never seem to get them to look the way I like, and the pins are super cute! Remember last month when I showed you this photo and said I was working on a new project??? Well this is the finished (well almost finished) result!!! 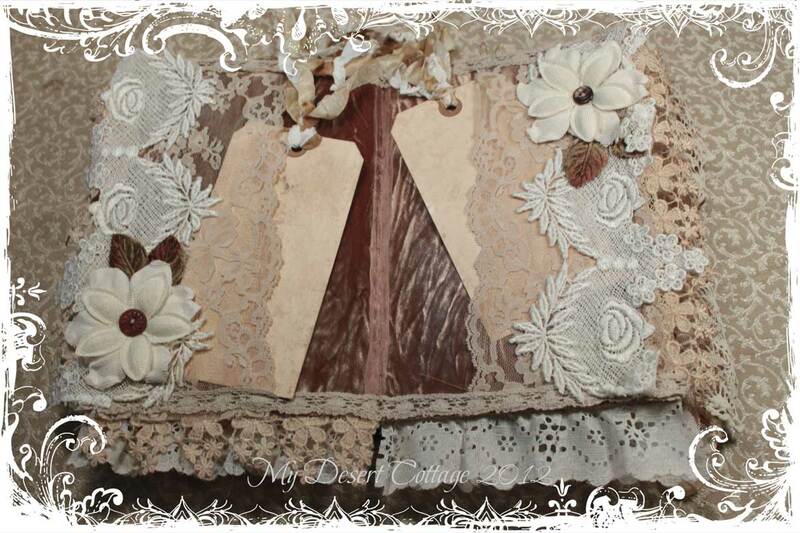 I had sooo much fun making this altered book, I want to make more!! 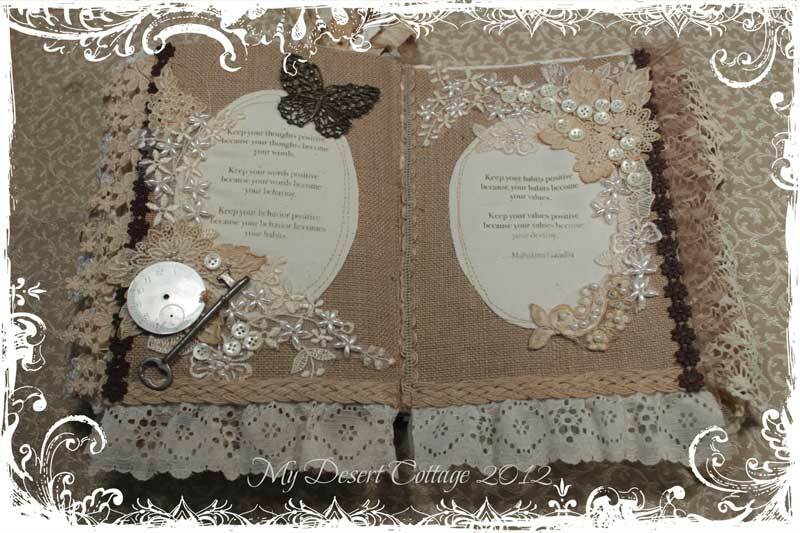 The first inspiration was seeing the photo of Lisa's FABULOUS book that she will be teaching at paper cowgirls. I had seen altered books before and I had always planned on doing one, but when I saw Lisa's I knew I couldn't wait. I had to get started making my own!! The second inspiration was Pinterest. I have a board called "Words to Live By" where I am collecting inspiring and motivational quotes to try and always remember and keep in my heart. I thought it might be nice if incorporated some of my favorites in this art book. This page still need the poetry or quotation added to the tags. Sometimes I have a hard time using my vintage supplies in art pieces because I worry that I won't be able to replace them, but I bit the bullet and used them with abandon in this book. This is the last finished page. I have one more to go and it will be completely finished. I am so excited to be finally taking one of Lisa's classes. I just know the techniques I will learn from her will help me finish the last page. And of course I'll be coming home with a brand new book to add to my collection! So tomorrow I am off on a plane to Texas to teach a class, take some classes, meet some old friends, make some new ones and generally have a fabulous time! I have wanted to do this for a couple of years now, and time has finally come! Yea!!!! I will try to take lots of pics and blog along as I go, but you know how things are... we ( I ) get so caught up in what we're (I'm) doing... sometimes I just forget!! So until I see ya'll again (that's Texas speak for all of you) have a wonderful week, count your blessings everyday, and smile because you are all very special! Safe travels and not that I need to say this - but HAVE FUN! Karen, you won some great treasures! 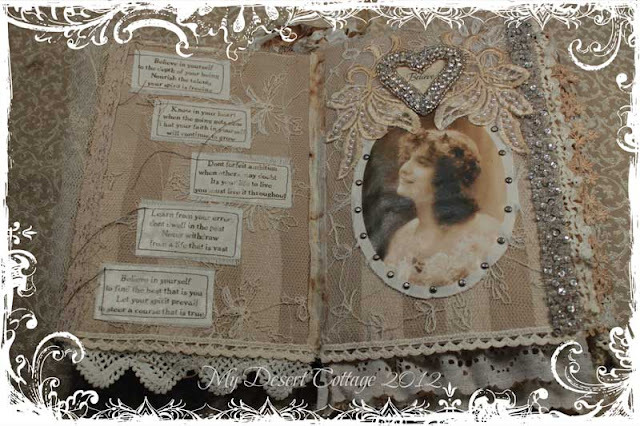 And your altered book; it's fabulous. I had never heard of this before and with each photo I'm thinking wow, look at this until I see the next one and start all over again. What beautiful treasure you received, enjoy! 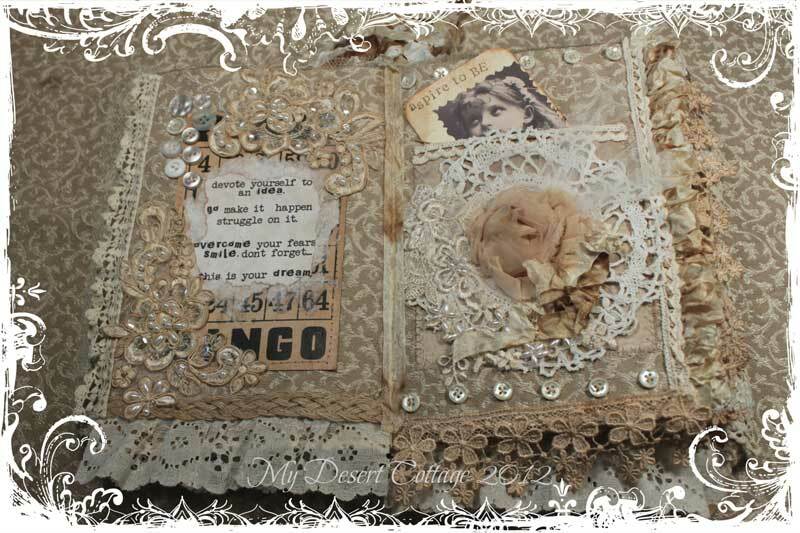 Your altered book is absolutely beautiful! Enjoy your trip and teaching in Texas!! Love your new book! Cindy told me about it & it is really pretty. Can't wait to see you tomorrow. Have a safe flight! HUGS! Hey Sweets.. Cool winnings!!! Have fun in Texas!! I will miss ya!! big squish!! 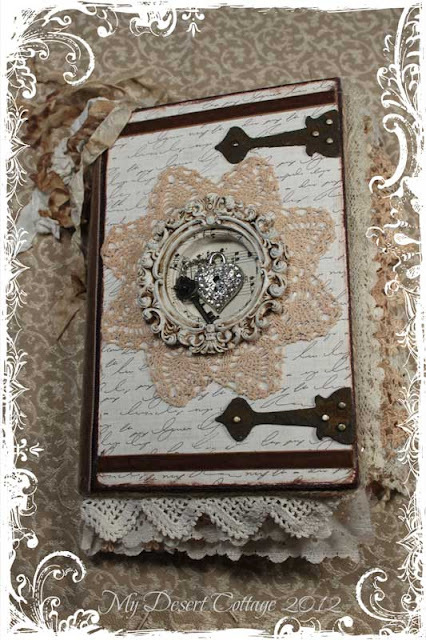 The altered book is fabulous! Doing that is one of my "someday" projects! I hope you are having a grand time in Texas!!!! Love your creative style!!! Beautiful work! Hey, I finally had some timeto sit down and comment today...thanks t oall this nasty snow:-( Anyways, congrats on your wonderful win and that altered book is fabulous!!! Congratulations! And I am loving your new header! what a beautiful post your works are wonderful! 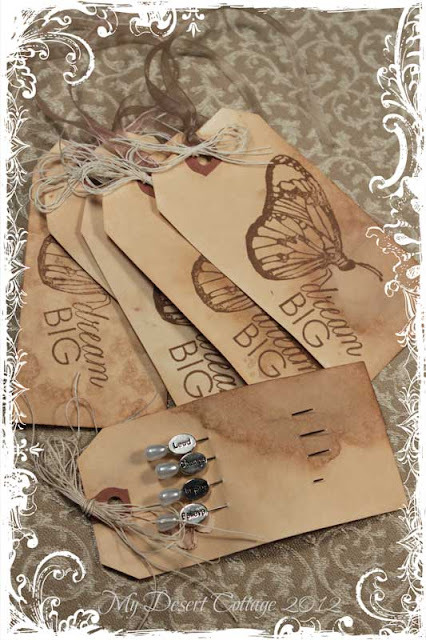 Congratulations on your beautiful lace and tag winnings Karen. Your new altered book is one you should be so proud of - it is looking gorgeous and well done for using some of your precious pieces in it too. Are you selling this or keeping it? 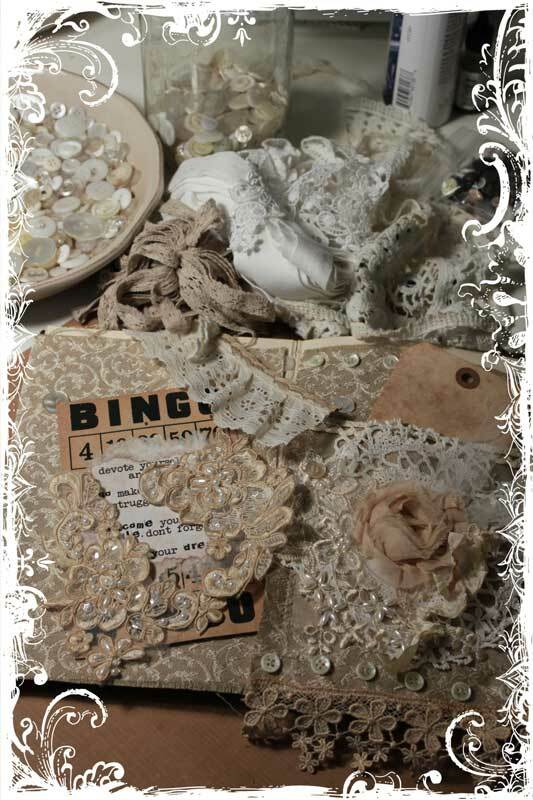 I have a sneek look at my new almost finished Bird/Spring journal on my current post! Wishing you heaps of fun in Texas! 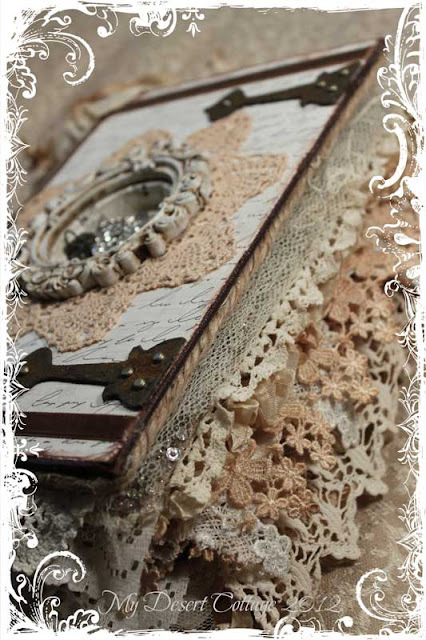 PS Now for a closer look at that new journal of yours!!! Have a wonderful time on your trip. I'm sure you will have a ball!! You go girl! Have fun fun fun! You lucky girl, what a wonderful pack of ggodies! And this book....wow....no words my friend, just stunning!!!!!!!!! Gorgeous journal! Have a great time can't wait to hear all about it! Hi Karen- congrats on your lovely winnings-- yes- you will find some wonderful uses for that lace! Your altered book is a magnificent project- beautifully created and photographed. Each page is a work of art. HI! 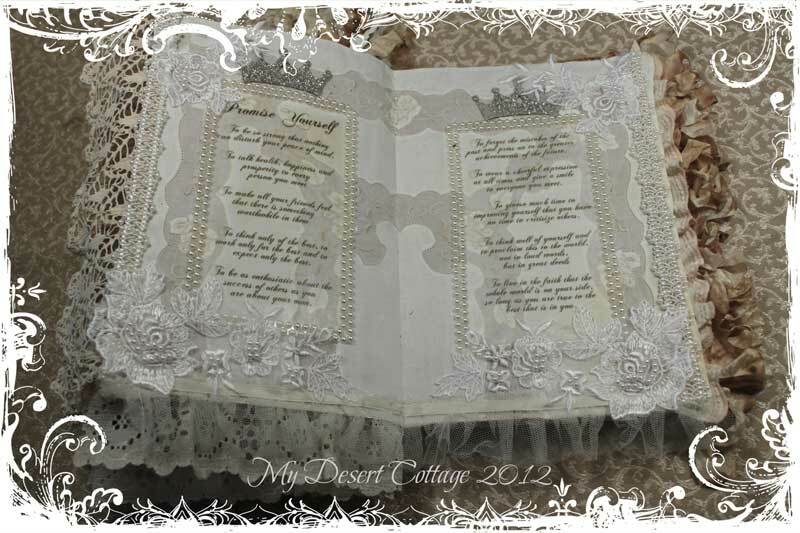 Karen, A very beautiful book with its lace pages.Love the page with the tags and the last page shown being white love all white.Nice giveaway prize. Cindy's having a fun YouTube Party!! !